We had the opportunity to review a physical set of Third Form Latin Complete Set from Memoria Press. Although I am not a box curriculum kind of girl, I absolutely love everything Memoria Press. I think the first time I was introduced to the company and its curriculum was through the Latin series with Prima Latina. Since then, I have continued adding various pieces from different subjects sold by the company. The curriculum from the Literature and Poetry series are favorites and the approach to early grade Science (more reading, studying and writing) has been enjoyed by my children. Our experience using the Latin curriculum was wonderful, which led me to decide to include the Form series of study in our high school years. We are using the study towards a foreign language credit. I have a degree in English and did not realize, until I was in college, how much I missed by not studying Latin while I was in high school. The fact that Latin is the base for so much of the English language is a good enough reason for me; a better understanding of our words, definitions and spelling. Some say Latin is a useless language and others can give great testimony as to why it should be studied. If we had continued with Memoria Press Latin after Prima Latina, we would have started using Third Form in the seventh grade, which is when it is introduced. The suggested age use is sixth through eleventh grades. Keep in mind, when it comes to a foreign language, placement is usually based on comprehension and not grade level. Starting an older child, as we are doing in high school, using the Form curriculum is all right and doable. The material is presented in an intelligent and comprehensive manner. These are everything you need to teach the course. I found each piece to be essential to teaching the course, including the DVDs, which some may tend to not purchase because “everything is in the books”. If you have no background or experience with Latin (and even if you do), the DVD instruction is a must. I watched the DVD lessons with River and enjoyed sitting back and letting someone else teach while I also learned. The layout of the course is pretty much the same as for the First and Second Forms, so transitioning into the Third Form level will not be difficult. In Third Form, there is a review of what is covered in the first two books of the series. Along with that, students continue working through all four conjugations. 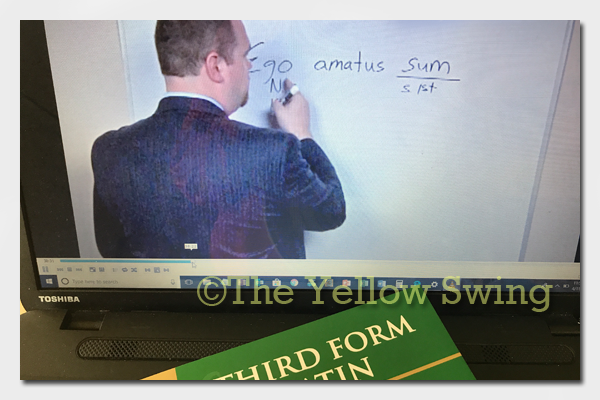 Although there is review of the first two levels, I would suggest not starting in Third Form unless your child has taken another formal Latin course and has a solid foundation. 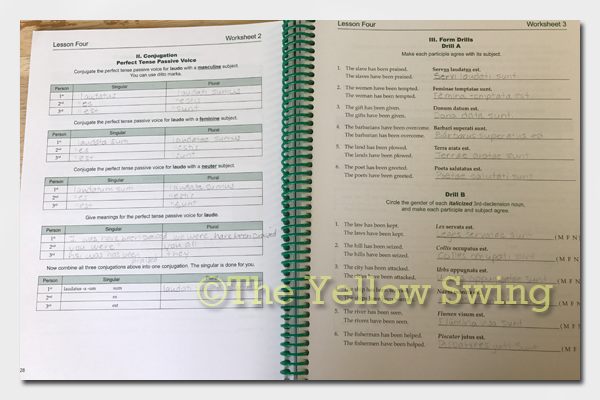 The foundation that is built (especially the vocabulary) in the First and Second Forms is vital to your child successfully working through the Form series. Watched the video for the lesson and discussed what we learned. Read or reviewed the lesson in the Student Text. Completed Workbook assignment or completed a Vocabulary Drill. The Flashcards were helpful for practice. All during the week, we did oral practice in preparation for the end of week quiz. The pronunciation CD was helpful for this, which we also listened to at the beginning of the week. The CD also traveled with us in the car and we practiced pronunciations as we drove down the road. The way we read or already pronounce a word may not be how it actually should be pronounced. Because language is about understanding, knowing how to properly pronounce the words is important. It was fun trying to pronounce all of the words correctly. Even though we have used other levels of Memoria Press Latin, I took the time to read through the Teacher Manual and watched each video lesson, before sitting down with River. There is a lot of information that is presented. The curriculum is one that could be used independently, but I found it was better to work through the lessons with him. We spent about 45 minutes to one hour a day on Latin. Another helpful resource available from Memoria Press are the lesson plans. The Teacher Manual walks you through each section of the curriculum. I think that is great, so I did not have to guess what to cover and how to teach it. Although, there are great details, I also like knowing what to teach each day. Memoria Press now offers digital and print versions of daily lesson plans for each of its studies. You may purchase a Third Form Lesson plan to see the suggested way to work through the lessons each day. It may be minor to some, but it is major to me. I absolutely love that the student Workbook is now spiral bound. It allows for ease in writing on the pages, because the book lays flat. River did not have to hold one side of the book open while trying to write. I would also be fine with the Teacher Manual being spiral bound. Another note, at times, the instructor spoke quickly on the videos, so we had to watch/listen to the lesson more than once. The quality was not as fine (editing) as I would have preferred and it did seem a bit dated (although made in 2011), but it does serve the purpose – will teach you Latin. Every once in a while. Lily and Canyon would venture into the room while we were going over our Latin studies. 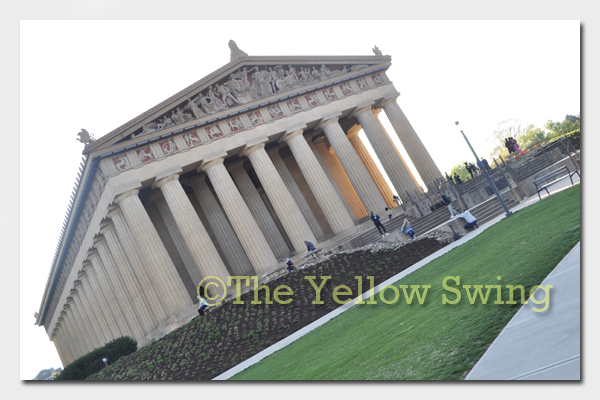 Canyon recognized a picture of The Parthenon (Replica), which is the picture on the beginning page of Unit II. The picture shown above is from our visit to the same location after leaving a homeschool convention that was held in Nashville. This is how much I love Memoria Press, I spent most of those convention days hanging around the Memoria Press booth; really. The representatives who work that convention site know me well. 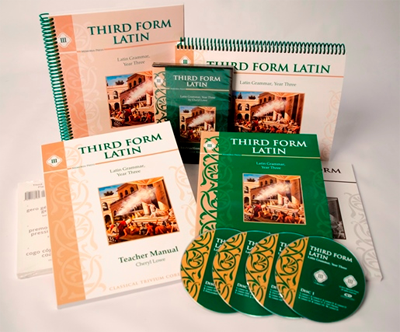 Memoria Press’ Third Form Latin curriculum provides the teacher and student with all of the tools to be successful in continuing their study of Latin. I am looking forward to moving on to the next level with Fourth Form Latin + Henle I. Music Appreciation 1 is another study I would really like to try with my children. Oh, Memoria Press just has so much from which to choose. 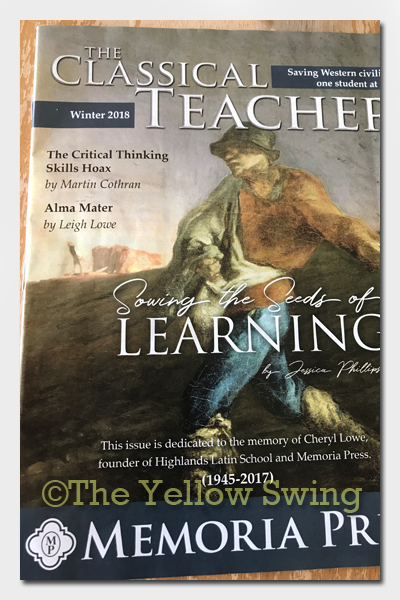 Whether or not you use Memoria Press or follow a Classical Christian education, you may be interested in signing up to receive The Classical Teacher magazine. I love seeing this magazine in my mailbox. 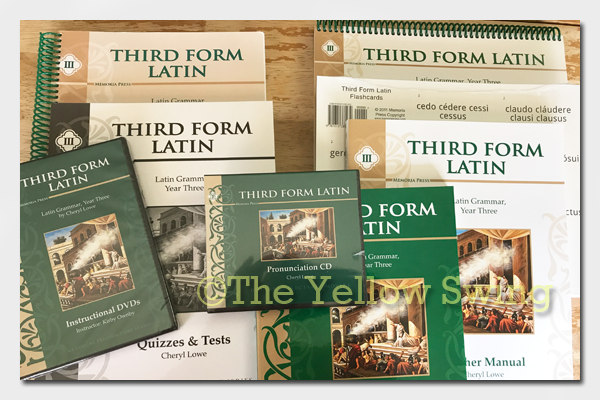 You may purchase the complete Third Form Latin set for $125.